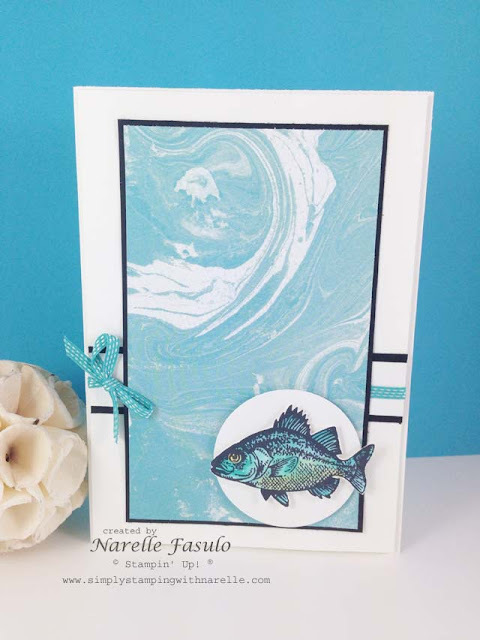 Today I wanted to do a card using the Perfectly Artistic Designer Series Paper which is retiring tomorrow. This paper is a FREE Sale-A-Bration item you can choose when you spend $90, BUT you only have until tomorrow to grab it. I love this paper so wanted to showcase it again. And while I was at it, I wanted to join in the fun over at the challenge blog - Global Design Project. If you haven't seen the Perfectly Artistic Designer Series Paper, one side has a water colour effect and the other a marble look. I have used this paper before with the Sky is The Limit stamp set, as the marbled side can represent the sky quite nicely. So I was looking through my stamp sets to find something else I can use. I came across the By The Tide stamp set. Yes !! The marbled paper would work quite nicely as the water. Don't you agree ?? If you love this paper as much as I do, then make sure you grab it before it retires.